SAAT Admit Card 2019: Candidates will have to go through SAAT to get admissions in the field of Engineering, Pharmacy, and Management in SOA University. Applicants will apply for the application form in a successful manner, will be able to download their SAAT Admit Card. It will be issued on the official website of the university. Candidates can get it through online process with the help of their login credentials. SAAT Hall Ticket 2019 is very necessary document to be produced at the exam center as it includes the candidate and exam details. The exam authority of SOA university will publish the admit card 1 week prior to the exam. SAAT Admit Card Date is not announced yet. Here we have provided the tentative schedule of SAAT entrance test based on the previous year exam date. Follow the link admission.soa.ac.in to download the admit card. Enter your “Application Number” and then click on “Log in” button. SAAT Hall Ticket will be shown on the screen. After downloading it, take the print of SAAT 2019 Admit Card for further use. Candidates are advised to keep the admit card safe till the admission procedure is completed. Must reach the exam center 30 minutes before the reporting time written on the admit card. Candidates are suggested to verify every detail mentioned on the Download SAAT Admit Card, if there will be any discrepancies, you can send email to the university official. If admit card found damaged or tampered, then candidates will not be allowed to take the exam. No one will be allowed to enter the examination hall without SAAT Admit Card & a valid ID proof (Aadhaar card/ PAN card/ Voter ID card). Read all other instructions written over the admit card carefully and follow it strictly. 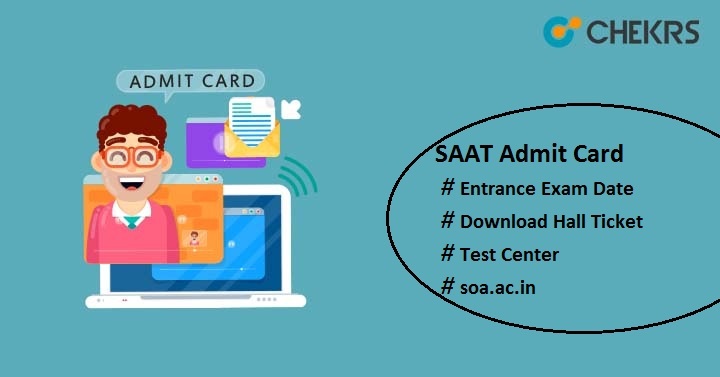 In this article, we have provided the useful content to download the SAAT Admit Card with steps to download, release date etc. In the case of any query related to SAAT 2019 Admit Card, you may contact to us by commenting in the below comment section. Good Luck!! !